The power of horror rarely lies in the script. Mood and atmosphere aren’t lines of dialogue or storyboarded action so much as a difficult balancing act every director performs. And while strong directors can elevate subpar scripts, they can’t save plots from themselves. 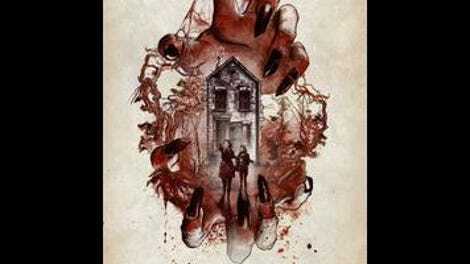 The new supernatural horror film Don’t Knock Twice benefits greatly from the direction of Caradog James. He takes a story that almost immediately plunges viewers into an unexplained and messy mythology and, for the better part of an hour, manages to distract from its weaker aspects by implying something far more interesting. Unfortunately, then the third act happens, and the spell is broken. This is the second film in a row where James has proven himself a talented orchestrator of complex low-budget genre fare (the first being his little-seen but effective sci-fi thriller The Machine), wringing the most out of a limited budget through moxie and smart casting. In its first hour, Don’t Knock Twice is repeatedly pushed in more compelling directions thanks to his directorial élan. Until some late-in-the-game reveals, the narrative is standard-issue hokum. The death of an oddball woman has been turned into an urban legend by local children, who say that by knocking on the front door of the deceased’s abandoned and decaying home—once to wake her, twice to summon—her malevolent ghost will spirit you away. After Chloe (Lucy Boynton) and her friend dare each other to knock one night, the friend disappears, and Chloe flees to the country home of her estranged mother, Jess (Battlestar Galactica and Longmire star Katee Sackhoff). From here, the jump scares and bumps in the night begin in earnest, and while James has a talent for the traditional methods of goosing an audience, his real facility is in laying the focus squarely on the fractured relationship between parent and child. Drawing influence from ’70s giallo and arthouse auteurs of the era like Nicolas Roeg, he repeatedly zooms in (figuratively and literally) on the space between the two, using eerie synths and protracted close-ups of their faces to suggest the real horror is to be found in the wary and worrying nature of the mother-daughter bond. Since the dialogue is wanting, he lets his two lead actors tell another story with just expressions and gestures, and it works, for a while. 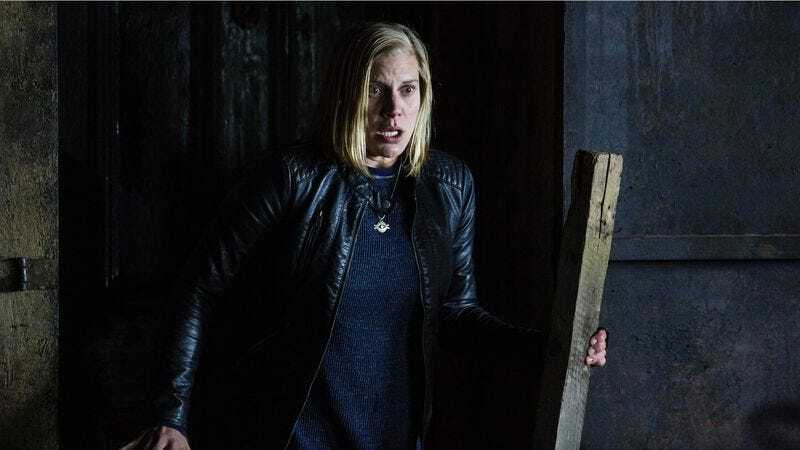 It’s hard to find someone with the energy to out-intense a spitfire like Sackhoff, but Boynton rises to the occasion, giving as good as she gets in an almost completely unspoken battle of wills. It’s easy to imagine the superior (and scarier) film that would come from a simple ghost story, were James allowed to simply employ these two actors and this setup, and go where his muse took him. Unfortunately, the supernatural being comes calling, and as Jess struggles to believe her daughter’s outlandish claims, the narrative expands to an unwieldy degree. Backstory upon backstory gets ladled on, complicating the plot in a manner that is supposed to come together at the conclusion with the intricate precision of a Rube Goldberg device, but arrives too hurriedly. Reveals meant to be viscerally thrilling come across both too pat and confusing at the same time—it’s all explained and made clear in bluntly obvious ways, but the mythos of the supernatural itself is left inexplicable, with evil forces that can seemingly adapt as the situation requires it, without rhyme or reason. An obsession with doorways suggests an earlier draft of the story may have resembled a less stupid Mirrors, but is never developed in any meaningful way. And the creature itself, while scary enough and artfully deployed, repeatedly attacks and retreats based less on logic than the requirements of the script. Still, Don’t Knock Twice manages to have some fun with both its retro stylistic trappings and its convoluted plot (which seems to draw as much inspiration as its director does from Euro arthouse horror of the ’70s). Thanks to cinematographer Adam Frisch, the massive interiors of the rural country-house setting look gorgeous, with deep blacks and dim settings never giving way to a gauzy or ill-lit shot. And the momentum doesn’t slack; even when the film gets weighed down by clunky exposition or yet another curlicue of unnecessary complications, it’s not long before we’re on to the next set piece. It’s a periodically scary and entertaining movie that provides further evidence that James has everything he needs to make a great film—except a script worthy of his talents.